A ‘Setback’ for Religious Freedom in Georgia? 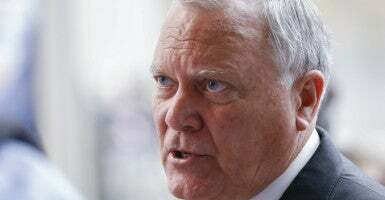 The sponsors of the religious liberty bill vetoed by Georgia’s governor say they are disappointed and disheartened by his action. Sponsors said they intended provisions of the bill to provide “defenses and relief” to “protect religious freedoms” of Georgians who don’t want the government to force them to violate their faith. Many Georgians, particularly those in the faith community, had been asking for these protections for several years and it is disheartening to see their will overlooked. This is a setback to be sure, but I am confident that Georgians will continue to advocate for the freedom to worship as they choose. Deal said the bill “can lead to discrimination even though it may be totally unintentional,” Chattanooga-based News Channel 9 reported. State Sen. Greg Kirk, a Republican who sponsored the bill in the state Senate and encouraged the governor to sign it, wrote in a Facebook post that he respectfully disagrees with the veto. “The Free Exercise Protection Act was a deliberately drawn piece of legislation that did not discriminate against the LGBT [community] and protected the faith community. In my opinion he gave into bullies!” Kirk wrote. For weeks, LGBT activists targeted the legislation for defeat and secured the assistance of major businesses and liberal allies to achieve that. Opponents said the bill would allow discrimination against lesbian, gay, bisexual, and transgender residents. Giant corporations and organizations such as the National Football League, Coca-Cola, and the Walt Disney Co. threatened to pull business out of Georgia if Deal signed the bill into law. “The economic threats made by big businesses to get the government to do their bidding at the expense of the common good are examples of a vicious form of cultural cronyism,” Ryan T. Anderson, the William E. Simon senior research fellow at The Heritage Foundation, wrote for The Daily Signal. The legislation, called H.B. 757 in the Georgia House of Representatives, included language protecting any “faith-based organization” from being required to provide services, including conducting marriage ceremonies, that it maintains would violate the First Amendment right to free exercise of religion. To that end, Hice said, he is co-sponsoring the federal First Amendment Defense Act, which was introduced in June 2015 and sent to the House Ways and Means Committee. U.S. Sen. Johnny Isakson, R-Ga., told Savannah-based WJCL-TV that he agreed with the governor’s veto of the religious freedom bill. State Sen. Joshua McKoon, a Republican representing the Columbus area, voted for the bill and told WBUR Boston that he was “extremely disappointed” by Deal’s veto. Mariana Barillas is a member of the Young Leaders Program at The Heritage Foundation.